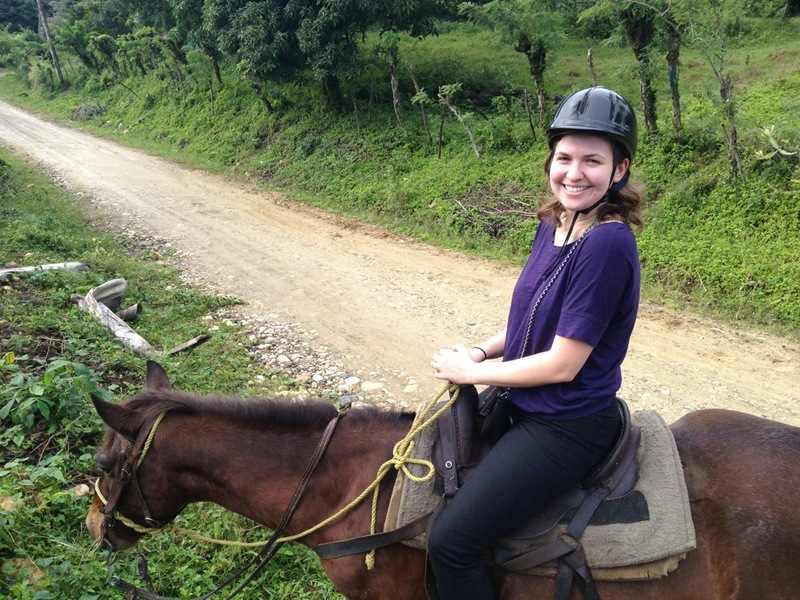 I rode a horse!! See, proof! So, days got switched, since early this morning I received an email back from the woman at Lorilar Ranch, which is a Canadian-owned, New Yorker operated ranch with half and full day tours. Lots of fun–we did about a 2 hour ride with a little break for a drink and to encourage us to purchase something from a tourist trap store in quite literally the middle of the jungle. I met some lovely Brits who were about my age (the woman is in a PhD program about…Spanish translation? ), and we basically just rode through this peasant neighborhood, in a jungle. It was lovely but so much poverty. Like, farm land and just…huts, basically. I mean, often made out of cement. But it was pretty much how communities in Mexico are. Not terribly surprising, but so…of the earth. I rode a motorcocha, which is basically a motorcycle taxi to get there, which cost me about $2.50, and was actually quite fun. My driver was the most talkative almost anyone has been with me, and very nice. The Brits were great–Katie and Mark, and we talked a little politics, and it was nice to converse with people who as I say, don’t seem me as some strange anomaly. They were only doing a half day ride, so that’s all I was able to do, which actually is quite fine. So this afternoon, I went to the beach close to my hostel. I understand now why no one knows were I’m staying (like, no one has heard of that part of town). 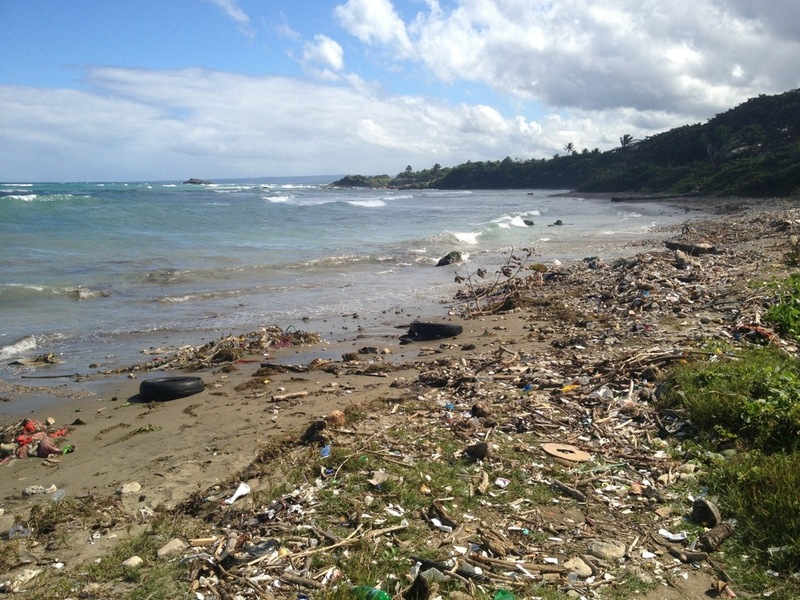 I don’t know why I expected from this beach, because I figured it wouldn’t be as nice as the beaches to the South in La Playa Dorada, but I did NOT expect mounds of trash, which is exactly what I found. What something is worth is a very strange concept. This part of the beach is quite rocky, so perhaps it never would’ve been worth anything. But look at this panorama!! That is incredible, right?! And for there to just be trash there, everywhere, like the area is worthless, is so weird to me. Even if you want to use it for yourself, wouldn’t you want it to be clean?? Maybe it’s cultural and I just don’t understand, but it’s so weird that just a few blocks away, there are these (allegedly, I’ll report back) pristine resorts and beaches, filled with lots if rich people paying so much money to relax and hang out in “paradise,” and just down the road, there’s a pile of trash on the beach. Maybe I should be used to that, because New York is very similar in terms of its tension between haves and have nots, but it seems more upsetting in a place that looks like what we think of as paradise. Then, again, there is more a sense of community here, which I think has to do with the poverty too. People have to rely on each other more. I saw a woman on a motorcocha holding not one, but two little children. I almost had a heart attack. But since then, I’ve seen a bunch more people with kids. Strange, but I guess it’s just normal here. Anyway, more later. I have a plan for tomorrow, and going to get food with another person who checked into the hostel today. But wanted to update you all so you know I’m alive ;-).